Invest only in blue-chips. After losing as many as 3034 points in the preceding four consecutive weeks, the Sensex ended last week with a marginal gain of 408 points following stability in global stock markets and especially the Chinese ones. 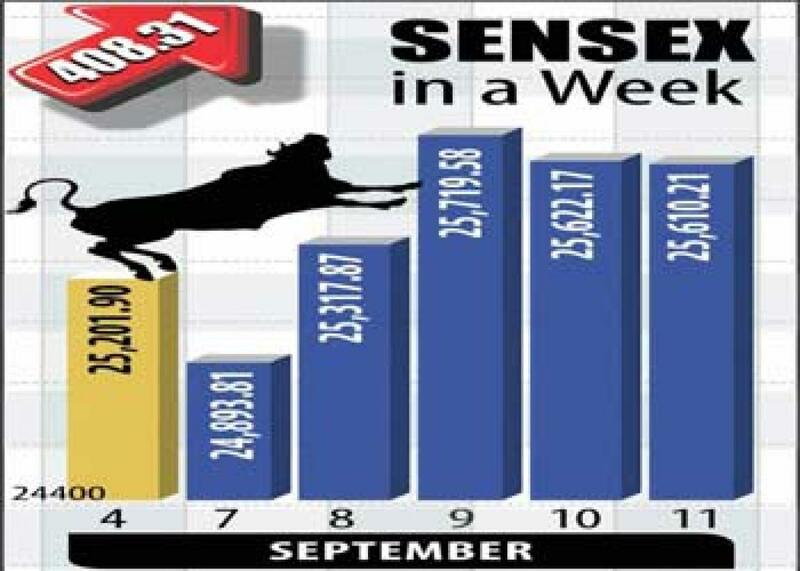 After losing as many as 3034 points in the preceding four consecutive weeks, the Sensex ended last week with a marginal gain of 408 points following stability in global stock markets and especially the Chinese ones. The market punters, however, turned cautious in the last couple of trading sessions ahead of crucial July factory output numbers scheduled for release on Friday after market hours, and also the numbers of advance income tax payments, to be known on Tuesday this week. Besides these two statistical blocks, anxiety over the outcome of the Fed Reserve's board meeting scheduled for Wednesday and Thursday of this week also kept the prospective buyers at bay. The commencement of eight day-long Paryushana Parvas of the Jains was yet another factor that came in the way of the markets from going up further. Generally, the Jains keep away from the markets during the Paryushana Parvas and therefore, the markets during these days mostly turns dull and lacklustre. As per the statistics, India's factory output grew at a faster-than-expected pace of 4.2 per cent in July, expanding more than 4 per cent for the second month in a row, signalling a slow and steady recovery in industrial production. The positive signal by output data could certainly help the markets up move next week but the short-term trend in the days to come would be based more on upcoming events. From early October the heat over the ensuing Bihar Assembly polls might keep the markets under stress and the impact could continue to be felt until the outcome of the polls is known on November 8. The month of October is even otherwise holds a bad reputation so far as the stock markets are concerned. Many a time, major crashes have occurred during this month in global stock markets including those in India. Therefore, the two month long festival season that is going to commence from September 17, with the arrival of Lord Ganesha, is expected to be lackluster this time and the Diwali days, are feared to be dull for the investors and traders. However, the long-term future of the Indian stock markets is very bright as the economy is progressing as per expectations. The reforms, though stalled for the time being, are going to be implemented by the government, which would bring FIIs back to India. The investors could also successfully do tax planning by investing in shares of companies that pay high dividends. At the current market valuations, many stocks are available at prices that offer over 4 per cent yield which would be free of tax in their hands against 8 per cent or less interest rates offered by banks on fixed deposits, which too is going to go down in future years for sure. In market investment, there is also a chance of getting huge returns by way of capital appreciation against a possibility of negative net returns in fixed deposits with banks or post offices due to ever-growing inflation. The small and big investors should now concentrate on picking up those shares that offer four per cent or more yields at their current market values. The only care that they must take is to invest only in ‘A’ grade and blue chip stocks and avoid other non-reputed names.